I knew there was something missing — forgot to post this photo in yesterday’s Wee Society giveaway post. This is what the back of the Wee Alpha postcards look like. As you can see, they make learning the alphabet and letter-sound correspondence incredibly fun. Not to mention the dose of rich, descriptive language each postcard offers as well as an enjoyable writing experience. This is not your run-of-the-mill abecedarian primer. It’s hard to resist a pop-up book, especially such a clever one. Little ones will be taken with how letters of the alphabet are presented through intricately-designed and well-executed concepts. A work of art that teaches as much as it inspires awe. ABC Pop-Up was created by Courtney Watson McCarthy and published by Candlewick Studio. We’re elated to add this new early reader to our collection. Laurel Snyder and Emily Hughes bring us a collection of four short stories celebrating relationships, siblings and the ordinary, funny and sweet moments that make up our lives as families. With short sentences and a good amount of repetition, Charlie and Mouse provides ample opportunities for young readers to practice the word patterns and endings they’re learning in school. The readability is late first/early second grade with a lexile of 230L. Charlie & Mouse was written by Laurel Snyder, illustrated by Emily Hughes and published by Chronicle Books. For a look at what our bookshelves really look like (and to read some thoughts on what we do to foster a love of reading and literacy at home), head over to an interview Tee and Penguin did with me on their blog. Thanks for having me, Sarah and Taryn! P.S. I’m starting a new series called #whataverysreading. I’ll post a stack of what she’s been reading lately every couple of weeks or so and would love to hear what other chapter books and middle grade books everyone is into these days. This brilliant alphabet book gets kids truly engaged in learning their letters by drawing and doing. A is for Ants — fill this anthill with lots of ants! E is for Elephant — draw the elephant that’s been smashing up this room! V is for Village — turn to the back of the book and use the square and triangle stickers to build a village in the valley. This one wins the award for smartest alphabet book ever. B for Bravo! 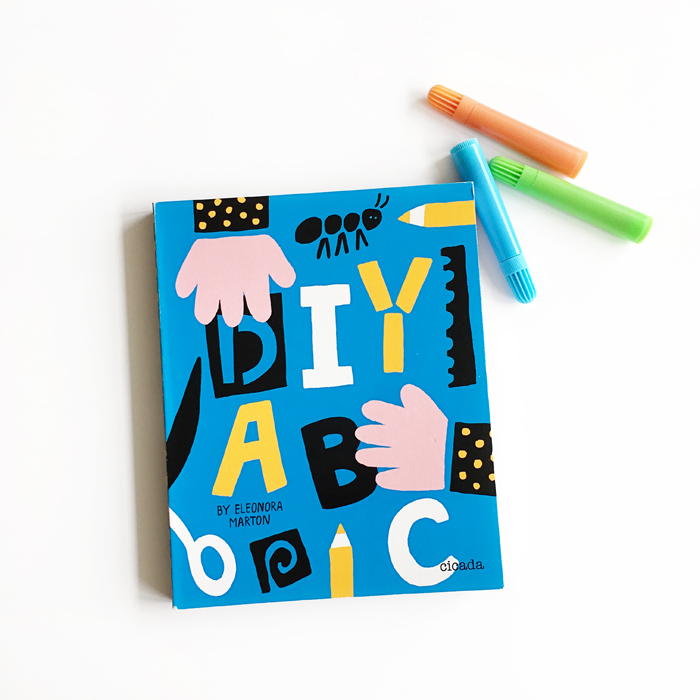 DIY ABC is by Elonora Marton and published by Cicada Books.